Tableau Public 8 is now available to download, and we think you’ll find this latest version of our free software as exciting as we do. It was designed to give you more power and flexibility to turn your data into even more engaging stories for your readers. It’s a data storyteller’s dream come true. "With version 8, Tableau takes a huge step forward not only in performance and usability, but also in its ability to create useful and interactive data stories. Freeform dashboards and increased display flexibility alone will allow people to tell more impactful stories that will resonate much more than any other BI tool can provide." To get a better feel for what Ryan means, take a look at his recent Viz of the Day winner that he published in version 8 about San Diego's PetCo Park. For my part, I just joined Tableau this past January, so I feel extremely fortunate to be a part of the team that brings you this product. 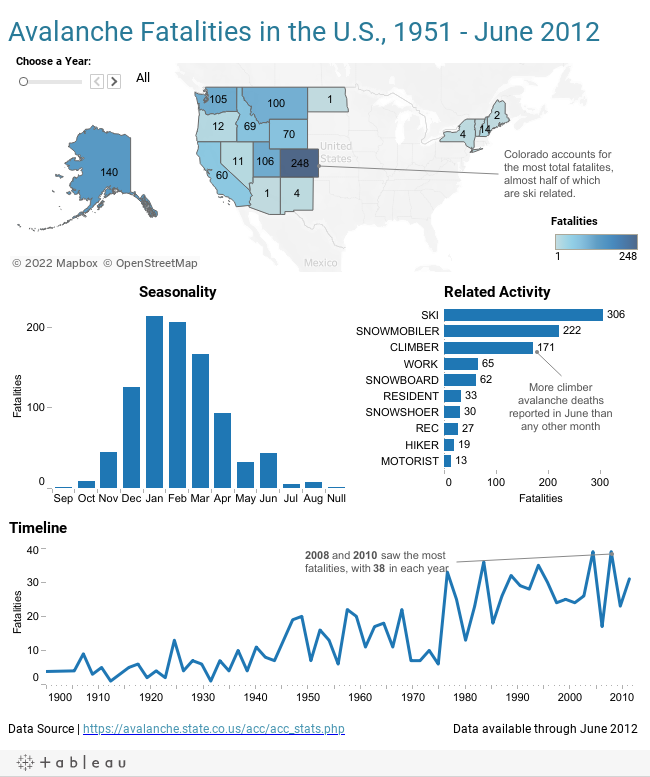 I’ve been a Tableau Public author for almost two years now, and I’d like to share a few reasons why I feel this product will be a game-changer for anyone wanting to quickly create and share enlightening data stories on the web. In short, it’s not a story of adding a few extra chart types. It’s about revolutionizing the way you arrange and display your data, and expanding the way readers can interact with your data on the web. It’s about unlocking stories in data like never before. That’s how I felt when I first saw it. So what’s the big deal with this new approach? Tableau Public has always enabled users to place multiple charts and objects together onto dashboards. In the past, the layout of these elements was limited to a “tiled” configuration, where objects could only be placed above, below, or to the side of other objects on the dashboard. With Tableau Public 8, you can place dashboard objects anywhere you want, including nestling them inside other charts, occupying the white space between borders and data. This new design capability frees you from the design restrictions of tiled controls. And that goes for all dashboard objects – text, images, web pages, legends, filter controls and charts. In order to help you get the exact layout you’re looking for, we’ve also included position and size controls that allow you to align floating dashboard objects precisely. No messy misalignment or slight spacing differences. Tableau Public has always empowered the data storyteller to create richly interactive data dashboards in a very short amount of time. Quick filters enable this simple creation process by allowing the user to filter a single worksheet (“local”) or all worksheets (“global”) on a dashboard. A scenario that would often arise, though, is that the user would want to have a quick filter control more than one, but not all, worksheets on a specific dashboard. Now that process is as simple as indicating which worksheets a quick filter applies to by clicking on the filter option menu. Want that date slider to filter your map and bar chart, but not your timeline? We’ve got you covered. Tableau Public 8 also gives you the ability to create treemap bar charts, word clouds and bubble charts – chart types that you’ve been able to make with other tools for some time, but not with Tableau Public until now. These chart types can give a sense of which categories stand out as the most prominent in a group, and they can be used with some skill to filter other more detailed charts or tables on a dashboard. There is a whole lot more in version 8 that we’re excited to bring you: browser rending, labels with multiple fields, creating groups by selecting marks, advanced set joins, and even text boxes with live hyperlinks – the list of new things you’ll find in Tableau Public 8 is quite extensive. The Tableau team has been busy making this product even more powerful, and even more flexible. So download the product today, and visit our training page to view free tutorials or to sign up for a free live training session with Tableau Public expert Mike Klaczynski this Friday, March 29th at 9:30am PST. Mike will be conducting a special session walking participants through what’s new in Tableau Public 8. Then, once you’ve got the hang of it, head over to our Elite 8 Viz Makeover Contest site and enter to win a free trip to TCC13. This time the contest will be a tournament, with the top eight entries squaring off head-to-head, complete with voting by tweet hashtag. We can’t wait to see what you create, and be sure to let us know when you publish by tweeting us @tableau. Who knows, you might find your work showcased as the Viz of the Day.